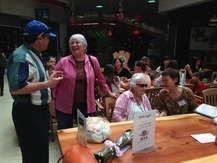 Tuesdays 9:30 - 11:00 a.m.
Join us to practice speaking English and meet new friends from all around the world! Improve your English conversational skills, meet new friends, and learn about different countries while you talk with people in a friendly, encouraging atmosphere. ​We will meet in the food court area, at tables near Boba Express. Look for ELLA signs on the tables. Have cup of tea or coffee, or pick up something to eat in the food court, if you like. We will meet in the food court area, at tables near Boba Express. Look for ELLA signs on the tables.